Brought to us by the writing team of J Bassoff (writing under the name J B Skelter) and Jack Reher is Rex'd:Welcome to Scholomance. Bassoff is an acclaimed noir author best known for his debut novel Corrosion and Reher (who we interviewed - here) is the screenwriter behind the upcoming film Grizzly. Which stars James Marsden, Thomas Jane, Billy Bob Thornton and Piper Perabo. Reher and Bassoff have also collaborated on bringing Bassoff's novel Corrosion to the screen, as adapted by Reher. So, noir and horror have come together and the result is a wonderfully fun, engaging and delightful read. If you grew up on the kind of horror that had you paralyzed by Poltergeist, entranced by the Universal Horror Monsters and staying up late reading the Choose Your Own Adventure books, well, I have your new favorite addiction and it is Rex'd. 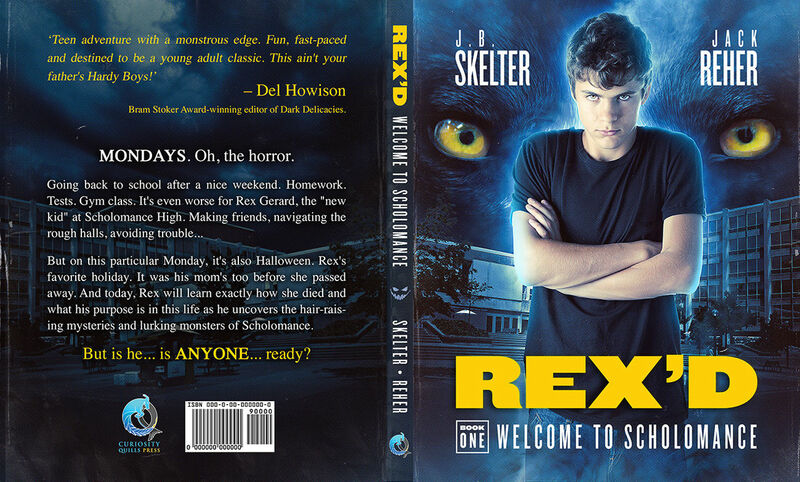 Although qualified in the YA genre, Rex'd is more Harry Potter and the exact opposite of Twilight. That's not to say that if you're a Twilight fan you won't enjoy Rex'd. I have simply come to terms with the fact that the term YA usually makes people immediately think of Twilight and that may, in turn, put them off a particular book series. I've read the Twilight series, The Hunger Games series and, of course, the Harry Potter series. Rex'd is most definitely from the Harry Potter side of things. Specifically because this is a book series that will take place as Rex progress through middle school and high school and also because these characters are lovely. You know you always wished that you could spend your summer with Harry, Ron and Hermione; Rex, Macen, Harlow and Lucy are no less engaging and relatable. It is on Halloween Rex learns that his life in a new town will bring a lot more adjustment problems than the average teenager would anticipate. Rex and his father, Dr. Gerard, have moved after the gruesome accident that claimed Marie, his mother's life; it's classified as an accident/bear attack, but Rex really isn't going for that. The events that take place tonight will change Rex's life forever. The action starts straight away with the first chapter letting us in on the fact that Scholomance Middle School's Halloween dance has turned into anarchy due to a strange animal attack. A large, unidentified animal has descended upon the middle school and Dr. Gerard can think only of his son Rex when he is called to help the emergency workers. It's then that he is told that Rex ran off with a vampire to chase the unidentified animal. Yup. Rex ran off with a vampire. Rewind to earlier that day, Rex is missing his mother, who is described as being a wonderfully different kind of woman, while he prepares for his big presentation at school. He was tasked with researching the history of his family and was delighted to discover that on his mom's side of the family, there is an Emily Gerard who wrote about all things Transylvania, Nosferatu and werewolf. She is even the one who inspired Bram Stoker to write Dracula. To reveal too much more would ruin the fun of reading the book. This is not a terribly long book; more of a novella. It doesn't lack for story or excitement, though. Rex, Macen, Harlow and Lucy all end up together as a motley group of kids who have been tasked with saving Scholomance from all kinds of things that go bump in the night. Aided by a mysterious book left for him by his mother, Rex gets a quick and dirty education in his true heritage and his true destiny. Along the way he encounters all manner of townspeople who have strangely familiar names to those of us weaned on the horror genre. In fact, a lot of the fun in this book is all of the little gems of horror history/trivia that are scattered throughout. Characters, their backstories and their potential story lines are all hinted at. The more you know of horror, the more fun info you will glean from all of this. However, do not be discouraged if you aren't currently feeling like a horror scholar. You don't need to know one single thing about the genre to thoroughly enjoy this book. That's what's so wonderful about it; it is fun for any age and any book lover. Rex'd is just a fun time and I'm truly excited to get my hands on future installments. Even more exciting than the prospect of more books is the fact that you will be seeing Rex'd adapted for the screen as well! So, be a cool kid and read the book so you can say that you already know all about it when people start talking about the movie.